San Diego Gas & Electric has released its 2019 wildfire plan, which includes 177 weather monitoring stations, a giant firefighting helitanker and a database of trees to be trimmed. The utility’s 2019 Wildfire Mitigation Plan is required by the state to help prevent electric equipment-related fires, improve the resiliency of the power grid to withstand extreme weather conditions, and keep customers and communities safe. “There is no higher priority for us than the safety of our customers,” she added. The plan was submitted to the California Public Utilities Commission on Feb. 6 in accordance with Senate Bill 901. The plan comes as another California utility, Pacific Gas & Electric, faces scrutiny in the wake of wildfires in Northern California and has filed for bankruptcy protection. Fire Hardening: More than 14,000 wood poles have been upgraded to fire-resistant steel poles in high-risk, fire-prone areas. Vegetation Management: An inventory of 463,000 trees located near power lines is evaluated on an annual cycle. Prior to fire season, crews trim trees to maintain proper clearance. 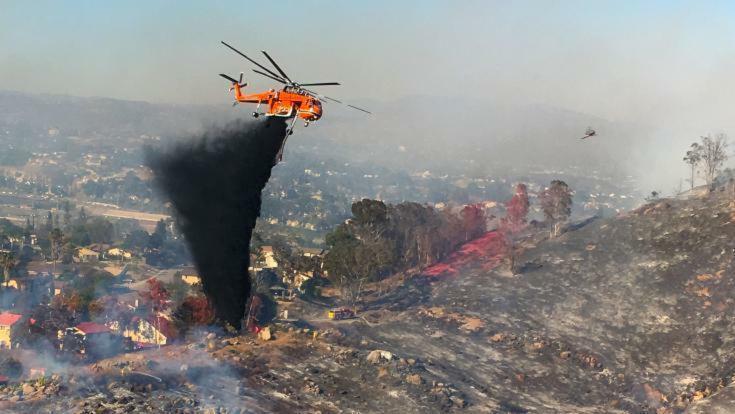 Aircrane: A firefighting helitanker is under contract for the 10th straight year and is available to all fire agencies in San Diego and South Orange counties 365 days a year. Fire Weather Monitoring: A network of 177 weather stations — America’s most-intensive utility-owned network — provides readings of wind speed, humidity, and temperature in fire prone areas every 10 minutes. Camera Monitoring: Sixteen high-definition cameras located on mountaintops help with fire detection by enabling a live-streaming view of the many fire-prone areas. Outreach and Education: The utility has a campaign to create awareness of fire threats and fire prevention, and opens special resource centers when power must be cut off for safety. SDG&E is a subsidiary of San Diego-based Sempra Energy, which is the utility with the largest number of customers in the United States.